After Jon and I left Porto we decided to make a fleeting overnight stay in the city of Aveiro, which is on the coast of Central Portugal. Aveiro is dubbed the ‘Venice of Portugal’ due to it’s Venice-like canals, bridges and gondola boats (known as ‘moliceiros’). We arrived at Aveiro train station late in the afternoon on a perfect day. It was lovely and warm and one of the first things we saw was how beautifully decorated the train station was with ‘azulejos’ (the blue tiles) we had seen throughout Porto. What instantly made our trip better was that nearly every man, woman and child were watching Portugal play in the World Cup so we had the whole of Aveiro to ourselves. We made the 15 minute walk to the city centre, checked into our hotel as quickly as we could, dropped our bags and then set off to explore Aveiro before the football finished. We did exactly what we did in Porto: walked around aimlessly and got a sense of the city. Aveiro is an old fishing town that is surrounded by salt-flats, beaches and lagoons. Unfortunately, to get to these salt-flats, beaches and lagoons you either need to take a bus or be lucky enough to have a car because the city is hugged by a very busy motorway and I wouldn’t dream of taking on Portuguese drivers whilst on foot. You can’t tell in this photo but the purpose of this circular bridge is that it joins the two canals and you can easily walk between the canal banks. After this we looped back around to the centre and came across a huge shopping centre called ‘The Forum’. Architecturally the shopping centre is quite beautiful but there is something inherently wrong about building a massive shopping centre right on top of a historical gem, especially when you’re on a canal tour and one minute they’re pointing out the picturesque salt-flats and the next it’s a shopping centre and office flats. It puts a bit of a damper on the whole experience and certainly doesn’t do Aveiro any favours. In the evening we had planned to treat ourselves to a meal out and came across the ‘O Bairro‘ restaurant, which directly translates into ‘the neighbourhood’. Here we had the BEST meal we have ever had in Portugal, hands down. On the second day we had enough time to have breakfast, go on a canal tour and then do a bit of shopping in the indoor market. We were really lucky with the canal tour because nobody seemed to be up and about at 10am so we had an entire boat to ourselves! The guide told us that many years ago salt production made the people of Aveiro very affluent and they would supply the rest of Portugal with salt. However, it now costs too much for the little man to gather the salt by hand compared to importing or gathering it on a larger scale. The guide said that along the street of the Ponte de Carcavelos nearly every building was a storage place for salt, but now only one remains. So with our trip to Aveiro complete it’s time for my potentially unpopular conclusion. I’m sorry to say this but I have now been to Aveiro twice and I still haven’t worked out whether I like the city or not! Aveiro may be dubbed ‘the Venice of Portugal’ but I think that this is a wild overstatement; if you are planning a trip to there you could see it all in an afternoon. I think Aveiro would benefit immensely from some renovation as some of the buildings have really taken a bashing from the salty winds and others look entirely forgotten about. Unfortunately the Portuguese felt that building a massive shopping centre on top of it was a good move but for me, as a tourist, it really dampened the experience. On this occasion I really enjoyed the food and the canal tour but beyond that there is very little to do or see. Having said that, I would certainly go back just to go to O’Bairro again! Next visit you might want to try and visit the Nouveau Arte Museum ( interior tiles, local artists' works displayed, and don't forget the lovely tea room). Solpoente is another great restaurant in the city. The city museum, cathedral, the little shops on the main street, and the university are other options. Worthwhile attractions: over the bridge Costa Nova with its cafes and candy-striped beach houses, the Lagoon where families still ply the waters in their small Molicieros gathering seaweed and eels, the Barra lighthouse and its beach, or perhaps Torreira for its beach and cafes with spit-roasted chicken. You can bike over the bridge to the beaches. There are also buses or car rental. Surprisingly, the first time I visited Aveiro I felt as you do. 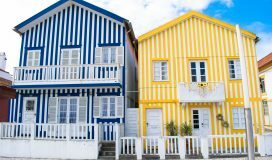 After I got home and started to write about the city and surrounding areas, I found so much that I had missed.Next visit I fell in love with Aveiro! Hi Connie, thank you for posting! I\’m always one to keep an open mind and as Aveiro is close to where my parents live then it is likely that I will go back. I just googled both Costa Nova and Torreira and they both look well worth a visit, thank you for that! Aveiro is a pleasant Portuguese town that makes for an enjoyable, alternative tourist destination. The town has a wide history which is closely intertwined with the growth and decline of its port and saltwater lagoons. There are great shopping centre, restaurant and bar. Lovely pictures! Thanks!!! !